Spinner Will Beer has admitted he is just happy to again be involved in the Vitality Blast T20 finals day for a Sussex side that is full of ‘superstars’. 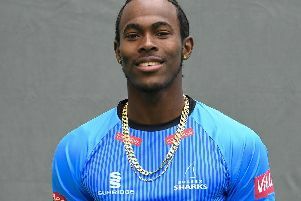 The Horsham-based leg break bowler is just one of the two surviving members of the 2009 winning county side in which he put in a sterling showing when Sussex lifted the crown. The 30-year-old one-day stalwart is again hoping to get his hands on the trophy as Sussex compete in the final four at Edgbaston on Saturday. Beer, who has featured predominantly for his hometown club Horsham in the Sussex Cricket League this season, couldn’t help but praise fellow bowlers Danny Briggs and Rashid Khan as he spoke ahead of the season’s climax. Questions had been raised with Khan’s arrival as to whether Beer would feature as predominantly throughout the season, but the leg break bowler felt he would always get an opportunity to slip back into the side. Beer emphasised the difficulty of getting into the squad with the many other talented bowlers all fighting for a place. He said: “You always think there’s a chance that it might be me or Briggsy to play with Rash, and to be fair to Danny, he’s bowled beautifully all year. I was unfortunate to miss the 50-over competition with injury and he bowled really well and I guess he took the momentum into T20. “The three of us played and then Chris Jordan came back from England so you’ve got all these superstars coming back into the team and it’s such a tough team to get into as a bowler. “All the guys have played international cricket. You’ve got the world’s number one bowler coming in as your overseas player. “I knew that Rash was going home at some stage during the competition so I knew that I was always going to get an opportunity towards the back end so it was just keeping faith. Beer also hailed the relationship between himself and Rashid Khan from a tactical point of view. He added: “I wouldn’t say I’ve learnt. It’s just talking about the game, talking about tactics. “Being able to talk and discuss various things around the game and around T20 cricket. Sharks have been drawn against Somerset in one of the semi-finals, with Lancashire Lightning and Worcestershire Rapids competing in the other. Live coverage of the day is being shown on Sky Sports with the action getting underway at 11am.